So, you’re about to send out a survey, or an appeal for donations, or a request for membership renewal. You know that too many of your recipients will chuck your envelope’s contents straight into the recycling bin. How can you make it more likely that they’ll respond to you? Randy Garner did a fascinating set of experiments on this. He first sent out a batch of five-page surveys to 150 university faculty members. A third of them received only the survey, another third received the survey with a handwritten message (“Please take a few minutes to complete this for us. 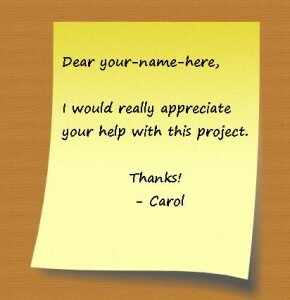 Thank you!”), and the final third received the survey with a Post-It™ sticky note bearing the same handwritten message. The differences in the survey response rates were startling. The survey alone got a response from 36% of those who received it. Adding a handwritten message brought this up to 48%. But putting the handwritten message on a Post-It got responses from 76% of those who received it – more than twice as many as those who received a plain survey. This made Garner wonder whether this was just due to the presence of the Post-It, so he repeated the experiment with another 105 faculty members. This time a third of the surveys had no message, another third had a blank Post-It, and the final third had a Post-It with the handwritten message. This time, he received back 34% of the plain surveys, 43% of those bearing a plain Post-It, and 69% of those with the personalized Post-it. Apparently the Post-It and the handwritten message were both needed to get maximum responses. Does this only work with requests that are easy to grant? And can we improve the results further? Garner did a fourth experiment with 180 university graduate students. Half of them received a five-page survey similar to those used in the previous experiment, while the rest received a much larger survey: 24 pages long with 150 questions, many of which required open-ended responses. Within each of those groups, a third of the students received only the survey, another third received the survey with the handwritten Post-It, and the final third received the survey with a handwritten Post-It that included the recipient’s name and was signed with the experimenter’s initials. Among those students who received the short survey, personalizing the Post-Its only helped a little (77% of the personalized surveys were returned, compared with 70% of those with the usual Post-It and 33% of the plain surveys). However, among those who received the long survey, it made a huge difference: while only 13% of the plain surveys and 40% of the regular Post-It surveys were returned, 67% of the personalized ones came back! It appears that putting a little effort into personalizing a request increases people’s willingness to help with it. This can obviously be useful when you’re trying to get a response to any written communication, but it might go beyond that. Educational research has found that personalizing lessons by including students’ names, friends and hobbies can improve learning of arithmetic among preteens and reading among kindergarteners, for example. Let me know if you try something like this and it works for you. Because it’s always nice to hear about the positive side of a sticky situation. Subscribe to comments with RSS or TrackBack to 'Let’s get personal'. You know, it would probably work… as long as you kept them away from Garner’s research, at least. Oh, the betrayed expressions!